A must have belly ring for the beach! 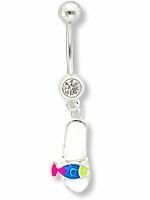 This belly ring has a crystal-jeweled bottom ball with a dangling beach sandal. The sandal has a multi-colored fish decorating the strap, reminding you to stay colorful and cool! A superb ring for any flip-flop or fish lover!